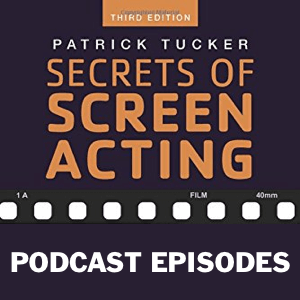 View cart “Secrets Of Screen Acting – Podcast Archive 24” has been added to your cart. Over 24 hours of audio, in 270 published 5-minute podcast episodes, plus 22 never before heard episodes, for a total of 292 5-minute podcast episodes. Listen as Patrick Tucker and David H. Lawrence XVII explore what makes today’s professional actors and voice talent successful, and how you can implement their techniques in your own acting and voiceover practice. NOTE: By purchasing and downloading this complete archive, you do not need to purchase the individual 10-episode archives. Download your episodes from the link in the receipt you’ll receive after purchase. DOWNLOAD THE ARCHIVE IMMEDIATELY and ONLY TO A MAC OR PC, not to a mobile device – the download link will expire within 48 hours, and the download is 543 MB, so make sure you have enough room on your hard drive.